Fagan's Grave is located on private property east of Monument at the northeast corner of Meridian and Evans Roads in Section 7, Township 11 South, Range 64 West. 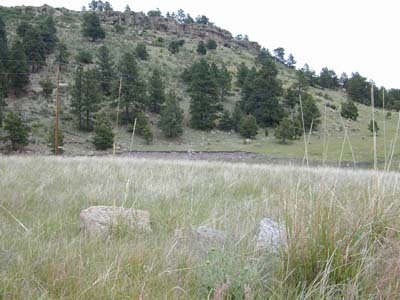 It is on the west bank of Kiowa Creek near Point of the Rocks by what was the Jimmy Camp or Cherokee Trail. According to GPS-derived geolocation (accurate to within 10 meters), the marker's coordinates are latitude 39°06'26.0"N and longitude 104°35'33.5"W. For permission to access the site, contact Ruth Ann Steele, 12820 Evans Road, Elbert, CO 80106. There is no inscription on the main stone, and sources disagree on the name of the person buried here. They do, however, concur it was a member of the Marcy-Loring Expedition who died in a blizzard in the spring of 1858. In 1859 Luke Tierney, part of the Russell party, published History of the Gold Discoveries on the South Platte River, in which he recalls seeing near Point of the Rocks on June 21, 1858, "a wooden cross, bearing the inscription, "Charles Michael Fagan 1858." 1. Dubois, Col. John Van Deusen. Campaigns in the West 1856-1861, ed. by George P. Hammond. (Tucson: Arizona Pioneers West Society, 1949). 2. Loring, Col. W.W. "Colonel Loring's Itinerary," Secretary of War Report, 1858, pp.183-84. Senate Doc. 2 sess., 35th Congress, Vol. 2, 1858-59, Serial No. 975 U.S. (Washington: William A. Harris, 1859). 3. Dickson, T.C. "Early Experiences of Col. T.C. Dickson," related by J.D. Miller. The Trail, Vol. III, (March 1911), pp. 5-11. 4. Kellogg, David. "Across the Plains in 1858," The Trail, Vol. V, (January 1913), pp. 5-12. 5. Cragin, Francis W., "Jimmy Camp," Colorado Springs Gazette Telegraph, 17 February 1957, p. 5.